It’s almost as if you hand mashed them yourself! 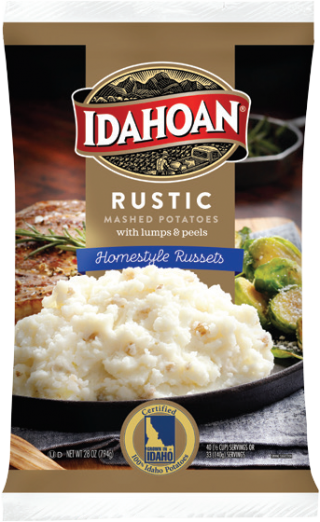 When it comes to authentic, field-fresh flavor, nothing compares to Idahoan® Rustic Homestyle Russets Mashed Potatoes! Made from Certified 100% Idaho Potatoes, with lumps and peels, lightly buttered and seasoned. Measure 1 gallon (3.78 L) of boiling water into a 6? x ½ size steam table pan. Add entire pouch of potatoes at once, using a spoon or wire whip to distribute evenly and wet all potatoes. Let stand 1 minutes then fluff with spoon or wire whip. For creamier mashed potatoes add more hot water. 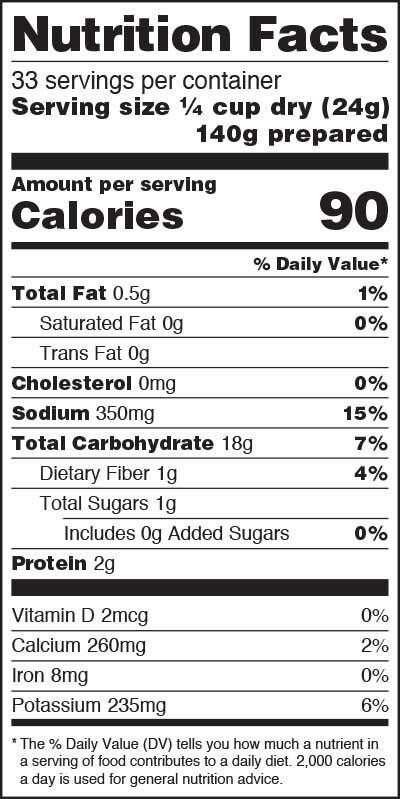 IDAHO® POTATOES WITH PEEL, NONFAT DRY MILK, SALT, SUNFLOWER OIL, MONOGLYCERIDES, CALCIUM STEAROYL LACTYLATE, NATURAL AND ARTIFICIAL FLAVORS, SPICE AND ARTIFICIAL COLOR. FRESHNESS PRESERVED BY SODIUM ACID PYROPHOSPHATE, SODIUM BISULFITE, CITRIC ACID AND MIXED TOCOPHEROLS.